Fans of The Crooked Jades won’t be disappointed by the latest issue from this remarkable group of musicians and I’m convinced that their newest CD, Empathy Moves The Water will quickly be added to existing collections of their music. Empathy Moves The Water will be the ninth album from the group since their debut album in 2000, and true to form, The Crooked Jades are alive and thriving and they just may have produced one of the best Americana albums of 2018. Newcomers to The Crooked Jades will find an exceptional album that should find a comfortable home in anyone’s music library. The group’s signature soulful sound that echoes shadowy Appalachian moods skillfully mixed with musical influences of Europe and Africa is as traditional as any string band or old-time band recording in the Library of Congress yet is worthy on its own as a musical statement that features innovation, virtuosity, and state of the art audio production. Instrumentally, the band utilizes a variety of old and new instruments that include guitar, banjo, Weissenborn guitar, bass, fiddle, harmonium and slide guitar. Several of the tracks are purely instrumental journeys of color and mood. Some, traditional string band music. Track 9, Long Time Traveling, is purely vocal done to perfection by the three women, Lisa Berman, Megan Adie, and Emily Mann. Track 5, Going Across The Sea, a familiar traditional song is a clear example of the unique arranging and execution of The Crooked Jades. It begins with a combination of sostenuto fiddle, dulcimer, harmonium and dobro to set an eerie modal mood. Once established, a burst of clawhammer accompanied by bass and percussion takes the unformed tonal base and gives it shape, tempo and vitality as the original melody takes command of the rest of the track. Each track is set up with a mood, sometimes utilizing instruments, and at times subtle and natural sound effects, but never to the detriment of the music - a worthy and delicate balance. The entire CD reveals the seamless playing of all the group members, yet in places, the overall effect is one of haunting mystery that suggests yet defies electronics. The result is highly cinematic, and the visuals that leap from the tracks make the experience complete. Film makers, take note. Empathy Moves The Water was produced by the celebrated Bruce Kaphan at Berkeley’s Fantasy Studios. Co-Producer was Jeff Kazor, band leader. Kaphan helps out on several tracks with pedal steel, guitar, harmonium and more. The engineering and overall production is smooth and mixed to perfection by Kaphan and Kazor without sacrificing the clarity of each instrument. The physical compact disc jacket and product was designed by Bob Ciano who designed many of the album covers for Blue Note, CTI and Kudo Records in the past. The CD is available on iTunes, CD Baby, Bandcamp, Spotify, and other music outlets. AP: The name The Crooked Jades – how come? JK: The name The Crooked Jades mostly comes from seeing the beauty in "the crooked road less traveled.” We are open and curious to the fringe, the strange, weird, and deemed crooked in society that may not reach the mainstream. Also, the name Crooked Jades comes from the fascination with (crooked) fiddle tunes. Fiddle tunes that are not square, unevenly measured - that don’t resolve in one measure and in another sometimes swallow their own tail. The “Jade” part of the name has so many different meanings…up for interpretation and hoping to create some mystery. AP: Who founded The Crooked Jades? JK: Lisa Berman is the Co-founder of the Crooked Jades. We have been working together on and off for the past 25 years. Something important to mention is Lisa’s revival of the Hawaiian slide back into the old-time instrumentation has been an important contributor to the evolution of what old-time music means in the modern day. AP: What is Jeff Kazor’s role in the group? JK: My role has been band leader from day one. The direction of the music, how we arrange the songs and tunes, present it, and what we wear on stage. I have been so fascinated to the point of obsession with traditional American music. There are so many hidden pockets and cracks during the turn of the last century and the sad part is very little of it was documented especially the black string band tradition. But as much as I love listening to Tommy Jarrell and the amazing syncopation between Fred Cockerham and Oscar Jenkins from Mount Airy Region, North Carolina, I find myself digging deeper in the old weird America. My research is what drives what material the band records and plays. I also am a big advocate of bringing original material into the Crooked Jades, but it needs to conform to the lexicon of the band’s prism, like in World’s On Fire and Shining Darkness which is an entirely original album. AP: Is the music creation process democratic? JK: For Empathy Moves The Water, the creative process was more democratic in nature than in the past. Everyone brought in a song and tune and most of these were tried and true since we had played them out for a couple years already. It seemed the universe was driving the creation of this album. 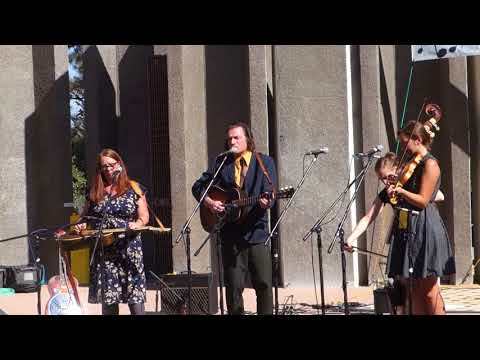 Our performance at Father’s Day Festival in Grass Valley in 2017 inspired a fan to put up the funds to record a new Crooked Jades album with this particular configuration. This was very exciting and so rare. AP: Fantasy Studios is now gone. Was your recording one of the last ones recorded there? JK: Pretty close to the last projects there. Five months later, this great long standing institution since 1968 closed its doors. The recording history is so incredibly rich especially in Studio A! The Crooked Jades recorded our new album in studio B and just in the nick of time. What a great creative artistic facility for film and music in the Bay Area now lost to the demand for high end condos. Fantasy you will be greatly missed! AP: Any comments about Bruce Kaphan and his production process with the Crooked Jades? JK: We had some time left over so we just rolled tape and played. I've worked with Bruce for many years as a producer / engineer for The Crooked Jades and many other projects. We have built a solid trust and respect for each other so when he said we have three more hours left in the studio and his marching orders were: "This is an opportunity to play some tunes or a song you haven’t prepared or rehearsed” There was some reluctancy but the improvised tunes ended up being some of the strongest material - Mike in the Wilderness, Pretty Little Shoes and Ryland and Spencer. AP: You mentioned World’s on Fire and a connection to modern dance. Can you clarify? JK: World’s On Fire was previously titled Bright Land. A 50-minute work of contemporary dances set to old-time music composed and re-arranged by The Crooked Jades. The project all started when acclaimed New York-based modern dance maven Kate Weare came out to see the Jades on their “Shining Darkness” tour at Café du Nord in San Francisco. A stranger to the band at the time, they all noticed her right away because she was inspired to get up and dance, not to a fast-driving fiddle tune like most audiences, but to a mournful Roscoe Holcomb ballad called Moonshiner. Later she told the band that she was moved by the skill, edge and depth of their music and felt inspired as a choreographer. So that’s what sparked this unlikely collaboration. And it really came to feel like the perfect union as the band was in turn inspired to reframe compositions to join Crooked Jades hypnotic old-time music with Kate Weare’s boldly poetic modern dance. From Worlds on Fire Promo - … World’s on Fire explores the cyclical nature of human experience. The smoldering choreography and fiery music, performed live by the renowned ensemble The Crooked Jades, lets us glimpse a slice of American history through the vivid portal of sound. The Jades work their magic within the lineage of old-time music. …World’s on Fire touches on themes of kinship, belief, codes of honor, love and the will to endure. JK: The Crooked Jades are excited to be releasing for the first time ever vinyl for Empathy Moves The Water album in February 2019. This will be our 9th full length album. The art work and design is done by none other than Bob Ciano responsible for some of the most provocative, beautiful album covers ever designed for Blue Note, CTI and Kudu Records during 1960s, ‘70s and ‘80s. The production of World’s On Fire will be performed with the Oberlin Dance Company March 7-10 at Yerba Buena Center for the Art’s, San Francisco and The Crooked Jades are looking forward to touring abroad 2019 in Germany/Switzerland and 2020 UK/Ireland.